Sooooo....after my run with the trail group last Saturday it became apparent that some time off was needed. The plantar fascitis was worse, my arch was killing me and now my big toe was numb. Eek! I haven't been to the doctor but believe I have P.F. and a strained hallux tendon. Definitely time to take time off from running. I have 3 races I'm signed up for in February but nothing on the schedule until then. So the plan is, no running for me in December but LOTS of cross training. I signed up for a boot camp class and went mountain biking yesterday. I had forgot HOW MUCH freakin' fun mountain biking is! I guess that is the plus side to taking a running break is I rediscover other things. :) I'm going to a yoga class today. Daily I'm doing lots and lots of stretching, foam rolling my calves, using the Footlog for my PF, sleeping in a Strassburg sock, icing my foot 3 times a day and massaging the arch with Arnica. Cross your fingers for me that all this works and I'm doing the right things! Happy running out there, friends! Hey!! It's great to meet an Okie bloggie (I'm from outside of Enid, I had a boyfriend in Hish School from Noble)! Taking time off sounds like a good plan! I hope it serves you well! 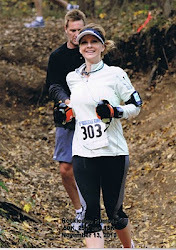 I need to catch up on your blog but are most of your trail races in OK? None of the ones in your side bar look familiar to me. Are you planning to do OKC again? I would love to but I'm not sure I can plan a trip to OK again that soon since we are headed there next week. Hi Amanda! The races in my sidebar are about 1/2 in TX and 1/2 in Oklahoma. Double Dirty Dozen is OKC, Lake McMurtry is near Stillwater, OK and Dan Man is in Madill, OK. Later in the year there is one out in Erick, OK and some in Tulsa. How crazy is it that you know where Noble is and had a boyfriend that lived there?!?! I went to school in Moore and moved to Noble about 17 years ago. I have been signed up for OKC Memorial half the past two years and have had to skip it both years because of ITB issues. Every time I train on roads now it flares back up so I mostly just run on trails. I made it out to the PNW for the first time last spring and fell in love..I know how hard it must of been for you to have left. We went to Portland then drove to N. California to the redwoods. While in Portland I ran the Forest Park trail race on the Wildwood Trail. Most beautiful place I have ever been! I know! So cool to have an okie around! My whole family is still there in the Enid/OKC area. My sister really wanted to move to the Moore area a few years ago. We are headed back to OK for Christmas! Wish we would have a chance to run together but trips home lately are jam packed with family time, especially with my dad being sick. It is hared being away from the fam. And all those races in OK! Wow! I know where every single place you mentioned is. I had no idea there were that many! I'm thinking I may make the switch to trails, some day. It just seems so much more beautiful! I hope you can do OKC one of these years! It is by far my favorite marathon. It could be because it was home and my family was there and I knew the area so well. A lot of the course took me back to my college days! It was fun! And the move from PNW to NC...it has been harder than I had thought it would be. I miss it terribly. And the worst part is feeling like I would want to go back and live there more than I would want to go live in OK. Of course my family is the OK draw but the PNW was just amazing. The culture and the active life style I was able to lead was so great. I miss it so much. It is hard to stay positive but I am trying! Sounds like you are doing all the right things...cross training to stay fit...time off from running...and I bet come February...you will be hard to keep up with on the trails. Press On!